Available in lengths L1 and L2, the Citroën Berlingo has an ideal load surface for the fitting of a Store Van mobile office. 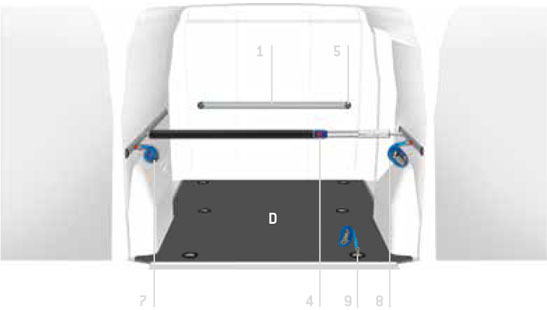 The installation process starts with the protective linings for the sheet steel of the cargo area interior, since sooner or later all commercial vehicles have to deal with the wear and tear, scratches and dents inevitably caused to the bodywork by the transportation of loads, especially if no suitable securing system is used. Choose to protect your Citroën Berlingo with the marine plywood flooring 9 mm thick with multi-coat phenol film finish, shaped to fit around the vehicle’s original load anchoring fixtures, and the polypropylene honeycomb side panellings. Also choose to secure the load with the “Load Securing” system, a highly effective system of telescopic posts, load restraining bars, straps and rings.